A new face has joined the Sand Creek Massacre National Historic Site in Kiowa County. Tommy Peevyhouse started his new duties as Natural Resource Management Biological Technician in March. 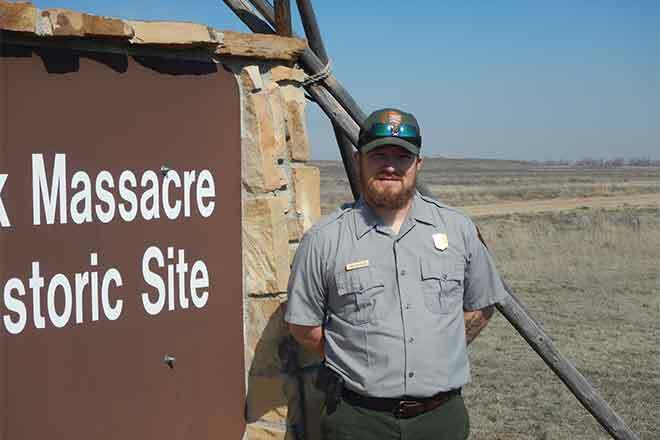 He began his career in the National Park Service as a seasonal Natural Resource Management Technician at Capulin Volcano National Monument in New Mexico, before transferring to Sand Creek Massacre NHS in March. Tommy Peevyhouse, Natural Resource Management Biological Technician at the Sand Creek Massacre National Historic Site in Kiowa County, Colorado. Courtesy NPS. Growing up in Oklahoma, Peevyhouse was raised around agriculture for most of his life until leaving for the military in 1998. He retired from the US Army in 2011 before working for the Oklahoma Department of Transportation. After four years with ODOT, Peevyhouse decided to go back to school and, in December 2018, graduated from Southwestern Oklahoma State University with a Bachelor of Science Degree in Parks and Recreation Management and an Associates of Science Degree in Wildfire Management. Peevyhouse and wife, Monica, are from southwest Oklahoma and have six children ranging in age from 4 to 18 years old. Currently, he is working towards a master's degree in Parks and Recreation Education.